'You're Invisible, But I'll Eat You Anyway.' 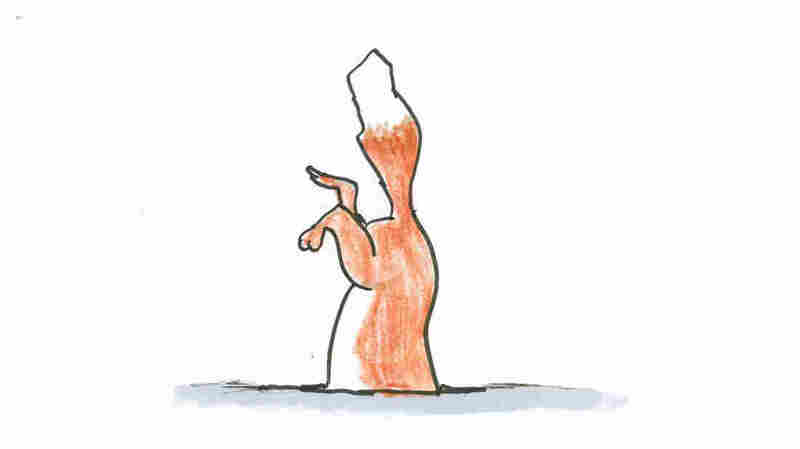 Secrets Of Snow-Diving Foxes : Krulwich Wonders... They leap into the air, adjust their tails, land headfirst in the snow, burrow down and hit a teeny moving target — buried 3 feet below. It's their lunch. How does a fox catch a mouse in winter? This is amazing. 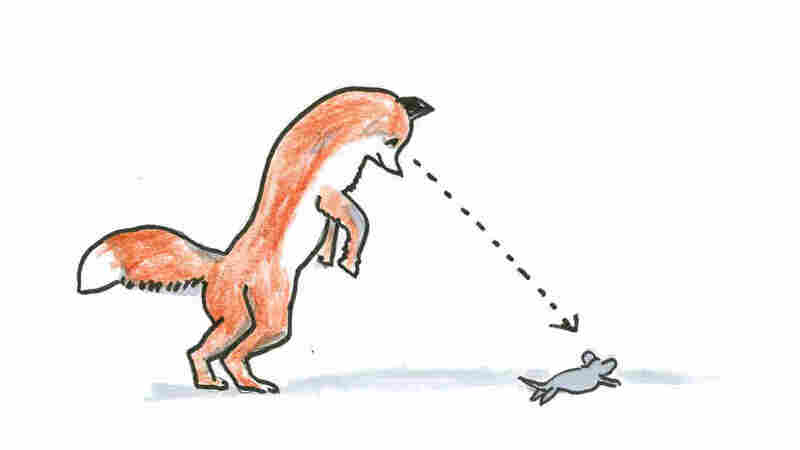 Think about this ... an ordinary fox can stalk a mole, mouse, vole or shrew from a distance of 25 feet, which means its food is making a barely audible rustling sound, hiding almost two car lengths away. 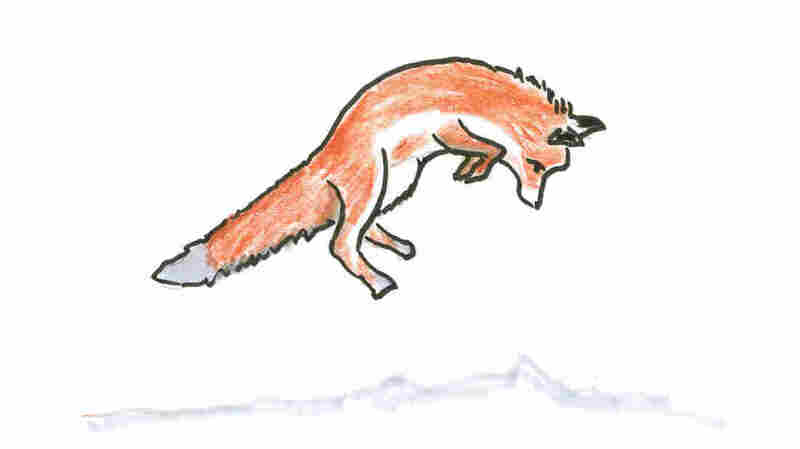 And yet our fox hurls itself into the air — in an arc determined by the fox, the speed and trajectory of the scurrying mouse, any breezes, the thickness of the ground cover, the depth of the snow — and somehow (how? how? ), it can land straight on top of the mouse, pinning it with its forepaws or grabbing the mouse's head with its teeth. 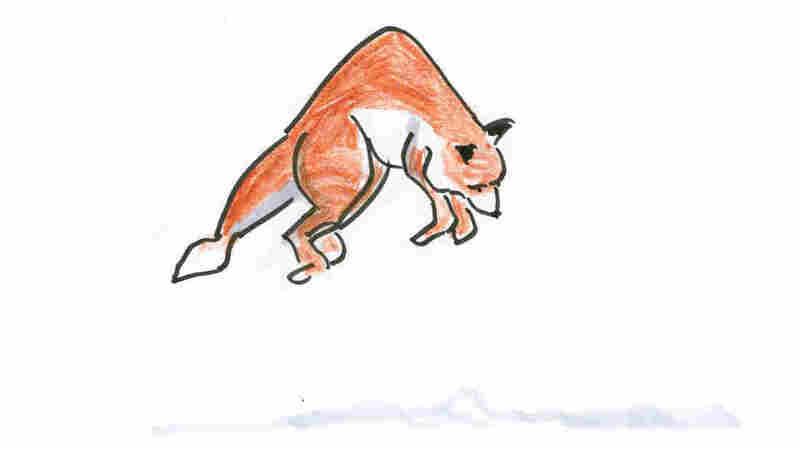 While in the air, I recently read, foxes can adjust their flight pattern by shifting their tails, ever so slightly, to one side or the other — and all this without seeing what they're about to eat. Drone pilots have nothing on foxes. These animals can be superb aerial hunters, and a few years ago a Czech scientist noticed something odd about how they do it. Jaroslav Cerveny decided to watch Czech red foxes catching mice in the wild. As reported by Ed Yong in his blog, Not Exactly Rocket Science, Cerveny recruited a team of 23 hunters and wildlife biologists who spread out across various meadows and fields and recorded "almost 600 mousing jumps performed by 84 foxes at a wide variety of locations and times." That's a lot of jumpin'. When they looked at each other's notes, the researchers saw a pattern: For some reason, Czech foxes prefer to jump in a particular direction — toward the northeast. (To be more precise, it's about 20 degrees off "magnetic north" — the "N" on your compass.) As the video above says, most of the time, most foxes miss their targets and emerge covered in snow and (one presumes) a little embarrassed. But when they pointed in that particular northeasterly direction, Ed writes, "they killed on 73 percent of their attacks." If they reversed direction, and jumped exactly the opposite way, they killed 60 percent of the time. But in all other directions — east, south, west, whatever — they sucked. Only 18 percent of those jumps were successful. Why this preference for a northeasterly/southwesterly leap? 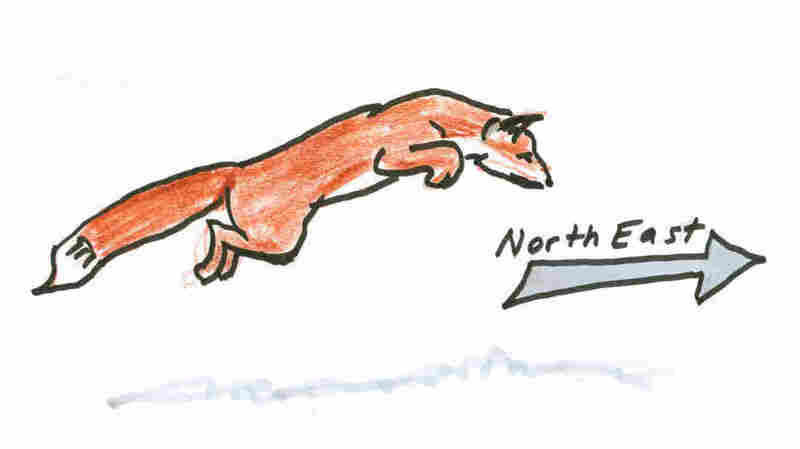 Cerveny found that foxes prefer to jump that way regardless of time of day, season of year, cloud cover or wind direction, so the northeast "advantage" isn't a temporary thing. It's constant. Cerveny can't prove this yet; he hasn't found a packet of magnetically sensitive cells or crystals inside a fox. That's going to take time. But if his theory is correct, here's how it might work. First, a fox hears something. She gets really quiet and tilts her ears. (You see this on the video — her head shifts, she concentrates.) She waits. There's another sound. Where, she wonders, is that sound coming from? Here's where I wish I were a fox. Walking around with a "magnetic sense," says Ed Yong, is like walking around with a flashlight attached to your belt (or head) — pointed down at a fixed angle. Let's make it a 60-degree angle. Wherever you are, this spot travels with you, ahead of you, as you move. You can sense it — like you'd see the beam of light from a flashlight that never quits. John Phillips, who studies magnetic senses at Virginia Tech, told Ed that the flashlight beam is analogous to the downward slope of the Earth's magnetic field in the Northern Hemisphere. While I'm not sure what that means, apparently animals know how to measure the distance between themselves and that sort of magnetic beam. 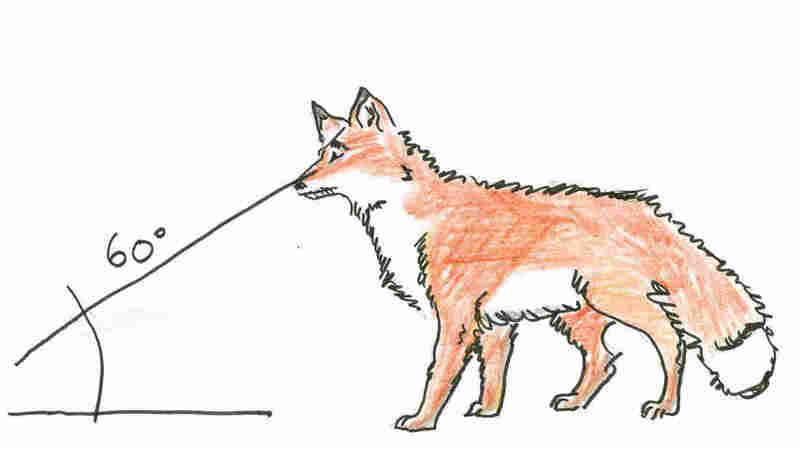 So, when a fox hears a sound under the snow, she searches "for that sweet spot," as Ed puts it, "where the angle of the sound hitting [her] ears matches the slope of the Earth's magnetic field." When the two are in alignment, then — like a treasure map marked "X" — she knows exactly where to go! And 73 percent of the time, she's exactly right. It's science like this that tells me creatures are doing ridiculously amazing things all the time that I can't understand, will never get to feel — which triggers, at least in me, another feeling, something darker. Animal envy. After reading these papers, I wanted to be a fox. Very badly. Not forever. Just for the time it would take to sense a magnet, to leap into the sky, to plunge down into a snowbank and land on my lunch. If there were only a fox wondering what it would be like to eat chicken with a fork, maybe we could swap. But ... I guess that's not going to happen.